Recent release “The Life and Times of Sgt. Joseph Thomas "Tom" Biway, USMC” from Page Publishing author D. J. Cotten is a thrilling work about the makings of a sociopath, delving into the reasons why some people only care about themselves and are only interested in self-gratification, even if others may get hurt or even get killed in the process of getting what he wants. D. J. Cotten, a seventy-three-year-old man who holds a degree in criminal justice and is interested in psychology, has completed his new book “The Life and Times of Sgt. Joseph Thomas "Tom" Biway, USMC”: a riveting story about a man who may be fully dedicated to the Marine Corps and the Washington government, but has a narcissistic behavior. Published by New York City-based Page Publishing, D. J. Cotten’s new book is an extraordinary story about Sergeant Biway’s lack of remorse for the unnecessary killings that he has done throughout his military service and suspension. He also lacks fear as he mistreats the men under his command, leading people to find evidence of his misconduct and watch over his every move. Readers who wish to experience this enlightening work can purchase “The Life and Times of Sgt. 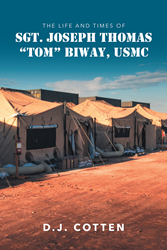 Joseph Thomas "Tom" Biway, USMC” at bookstores everywhere, or online at the Apple iTunes store, Amazon, Google Play, or Barnes and Noble.